2016 has arrived. All the DareBoost team presents you its best wishes for this new year. This post is a retrospective of the major changes within our service in 2015, and will allow you to (re)discover some of our features! After the redesign of our performance reports, we added some new metrics, extracted from the video analysis of the tested page. Indeed, measuring the technical loading time of the page is not enough in order to express the user experience when accessing your pages. So we added an access to the video of the page loading, and a filmstrip to inspect it frame by frame. The new metrics computed from the video analysis are the following: Start Render, Speed Index and Visually Complete. 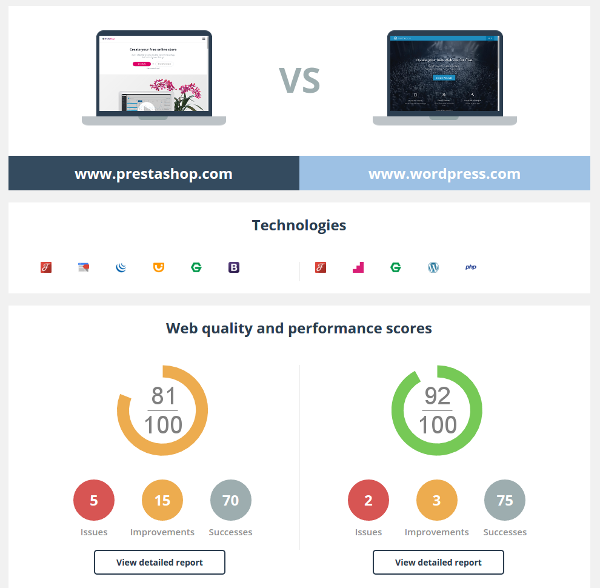 Since the launch of the first beta version of dareboost.com, 2 years ago, many of you asked us to compare the speed and quality of two pages. We met your expectations in 2015, with the comparison reports! Dareboost is a great analysis tool to help you optimize your web pages. But this is only the beginning! For instance, significant changes occurred over the past year to improve our monitoring feature. A regression in your pages’ quality? A slowdown? A new recommendation from Google? Be warned quickly thanks to our automated email alerts! You can also keep an eye on your competitors, without effort! Whether for the audits triggered manually or through the monitoring of your web pages, we systematically check dozens of quality best practices. Optimizing the security, loading times or SEO: our tool is one of the most complete tool to analyze your websites. Other features appeared during 2015, including new advanced settings for your web performance audits and monitoring. Moreover, Adblock is available since a few weeks! We also enriched the available test locations, with the arrival of Germany, Australia, Japan and Hong Kong. Go on dareboost.com to enjoy all of these features! And once again, we wish you an happy new year.